In June of 2017 we took out an equity loan and hired a contractor to help us install a large paver patio, path and decomposed granite around the pool. We've been working on the area around the pool every year since 2013. In 2015 we resurfaced the pool and planted photinia all around the fence line. As a reminder, this is how the pool looked when we bought the house in July of 2013. The first thing we did was put a fence around the pool. Erik was only four-years-old when we bought the house and we needed to feel safe. We hired a pool guy right away to get it clean and running again, unfortunately, that meant buying a lot of new equipment. We knew that the pool had been coated with fiberglass that was falling apart, and we were going to have to remove it and replaster. 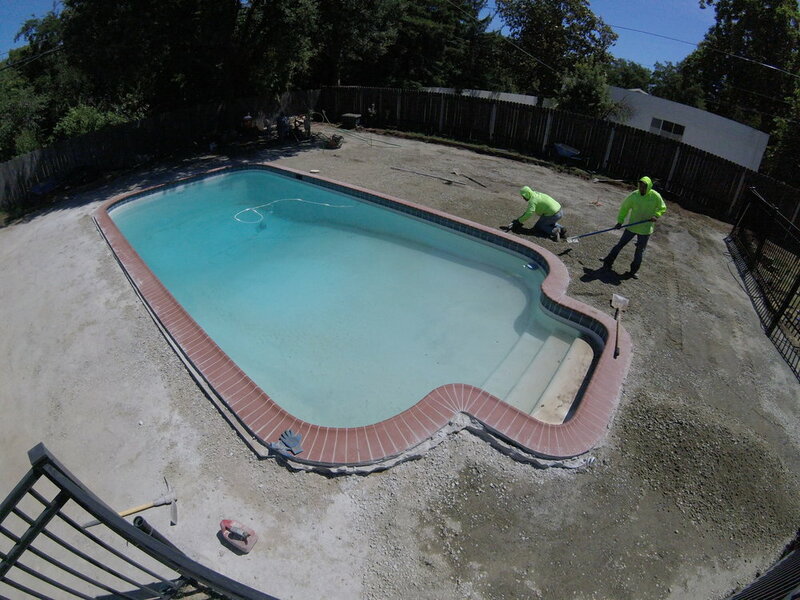 In 2015 we hired a contractor to resurface the pool and intall new coping and tile. I HATED the grass around the pool and the path that dropped off into weeds was terrible. The walk to our pool is crazy long. We had to mow the weeds every weekend and it still looked terrible. We had to do something, so we did. In 2017 we invited a paver contractor over and he gave us ideas. I knew we couldn't afford pavers everywhere but there was NO WAY we were keeping any grass. I was not mowing this area ever again. We knew that decomposed granite would work, and we included that in the project. The project took several weeks but before we knew it we had a gorgeous paver patio and FINALLY a completed path to the pool. We love our paver patio. I will love it more when we pay off the home equity loan we took out to pay for it, but this yard smiles now. It felt so neglected and uncared for and now it feels so much better!! We are dealing with a big crabgrass issue in the decomposed granite, but the photinia is finally growing taller and that makes me SO happy. Someday the fence lines will be lined with gorgeous tall hedges and I will plant something in the DG to squash the crabgrass. I hope to build a pergola as well. We are planting a tree next to the pool fence this fall in hopes it will shade a bit of the pavers closest to the pool gate where we have all the crazy amount of umbrellas. The pavers get REALLY hot because there is no shade. We have spent hours of fun in our yard and we are so grateful to have this place to enjoy and share. Cheers to change! It happens people, it happens!! !